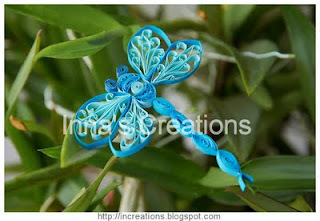 My children love quilling just like I do, and I keep saying this craft is suitable for kids. Here's just one example. Some time ago my eldest daughter who is 8 years old created this blue dragonfly. She saw me making the flower with curled petals, and wanted to use the same technique for dragonfly's wings. She used the standard 1/8"-wide quilling strips (hand-cut). The dragonfly measures about 2 3/8" (6 cm) in length, 2 1/8" (5.5 cm) wingspan. Those of you who are going to try quilling with children might like the article Paper quilling for kids: 10 tips I wrote earlier. Links to other examples of quilled insect designs can be found in this round-up post: Insects — quilling designs. great as your children have made ​​beautiful dragonfly! You've taught her well, Inna - wonderful dragonfly! awesome！can't believe it's from an 8 years old. this is so beautiful your daughter is so talented she done a very good job on this dragonfly. Thanks all very much for your kind comments! Like mother, like daughter.. lovely dragonfly..
Wow, it's a wonderful specimen! I really like those colours too. Gorgeous, she takes after you, love the wings! So happy to hear that chidren are getting involved with this art!!! Hi Inna, just posted about this project on Craft Gossip's Lesson Plan page. You are so talented at Quilling, and its really inspiring that your children have such an interest too! Here's the link, and feel free to send me links when you come up with another project for kids! Вот это да, Инночка - да у вас это семейное!!! Не представляю как в таком возрасте можно такую красотищу сделать. Наверно, только имея Такую маму в качестве вдохновения!!! Lovely dragon fly!! My kiddo is 5 and loves to try her hand at whatever I do. I once let her even try parchment craft! Well, it is very hard to believe, it is done by an eight years old kid. Your daughter is very talented. It is very exquisite work. Wow...amazing it's made by an 8 year old, she is a clever kid! Hi Inna: I'm a therapist who works with children who have experienced some form of abuse/trauma. I find that paper quilling can be very therapeutic for them; one of the things I always stress is that no matter what happens to the paper they "twirl" it's never a mistake because whatever they curl can be used for something. I've also found that "googly" eyes are a big hit on any creatures we make! Teresa, thank you very much for the valuable information! You are absolutely right. By the way, Jane Jenkins in her excellent book "Quilling: Techniques and Inspiration" recommends that children use their fingers only. My younger daughter, for instance, doesn't use a quilling tool at all. I think you might want to try this with your patients. You are awesome Inna. I love your creations.